Yep, the NHRA Mello Yello tour is off to Maple Grove Raceway in Reading, Pa. this weekend. I, however, will be heading in the opposite direction. As mentioned in last week’s blog, I’m instead flying to John Wayne Airport in Orange County, Calif. for a bit of sightseeing and info gathering. It’s a “location scouting” visit for the new book that is officially underway. The trip will help me get a real feel for where my SoCal character grew up, went to school, and surfed. And to make it even better, I’m having lunch with Jeff Morton on Saturday. Jeff is Director of Advertising Sales for NHRA and he’s big into baseball in Southern California. He should be, because his son Kale was a left-handed pitcher at Glendora High, then went the University of Arizona before transferring back home to play his final three seasons at Azusa Pacific University, where he had a fine career. Jeff has already been digging back into SoCal high school history for me, finding schools, teams, and locations that would fit the time line I’m developing, and that’s awesome. Plus, he’s a great guy and a lot of fun. We share a lot of the same passions and I’m sure it will be a lively conversation, as well as a great learning experience for me. I shall take notes! It’s coming together. Slowly. (Click on any image to enlarge). In other breaking news, here at the Wilber/Doyle ranch our new propane-fueled fire pit is lonely. We have some chairs we are cleaning and staining (they need it, after being out in Minnesota weather for years) but we’ve only had time to do the cleaning part so far. Our garage smelled like bleach for days. So, the fire pit sits out on our new patio by itself. We have plans to buy a couple of custom made Adirondack chairs as well, but that is still just a plan. 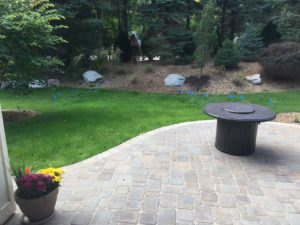 At some point, we’ll have the patio we always wanted. I did order a vinyl cover for the fire pit, yesterday. We had one ordered from the furniture store where we bought the fire pit but sent it back with the delivery guys for two reasons. It was only half as tall as the pit is, and it came in the shape of a square. Our fire pit is round. They tried to explain away the shortness problem, by telling us “Oh no, that’s the way it’s supposed to be. They’re all like that.” No they’re not. There’s a thing called the internet. I found a cover that is exactly the same diameter and height as our pit. Wasn’t that difficult. As for the square issue, well they didn’t have much of a comeback for that. As you can see, the grass is finally coming in now, too. After the landscapers graded the yard and prepped the dirt, they spread seed before putting the straw erosion blanket over everything. I know it’s nearly impossible to spread seed absolutely evenly and perfectly, and that over time the roots of the grass will spread and create new grass, but I don’t have that kind of patience and there were a lot of bald or thin spots. So I had the guys come back out and remove the blanket, then overseed it again. Plus, I overseeded it for a third application. Now it’s starting to look like a yard instead of my head. Get it? Still need to keep the blue flags in place, to keep the HOA contractors from mowing the new grass. It’s not ready for that yet. And writing about the roots of the grass triggered a memory of The Grass Roots, a band from the 60s and 70s. They were good, in a catchy pop sort of way. Always good melodies and hooks, in songs like “Wait A Million Years” or “Midnight Confession” or even “Temptation Eyes.” Hope I gave at least one or two of you a good long-lasting ear worm with those titles. Mike Hohler gets to see Target Field. Barbara and I had some big fun on Saturday, this past weekend. The San Francisco 49ers were in town to play the Vikings in both teams’ openers for the NFL regular season, and that means my buddy Mike Hohler was in town as well. The team flew in on Friday night, so Mike had all day on Saturday to see some sights and check another ballpark off his list. We met at Target Field about an hour before the first pitch of the Twins-Royals game, up in the Bat and Barrel club in right field. 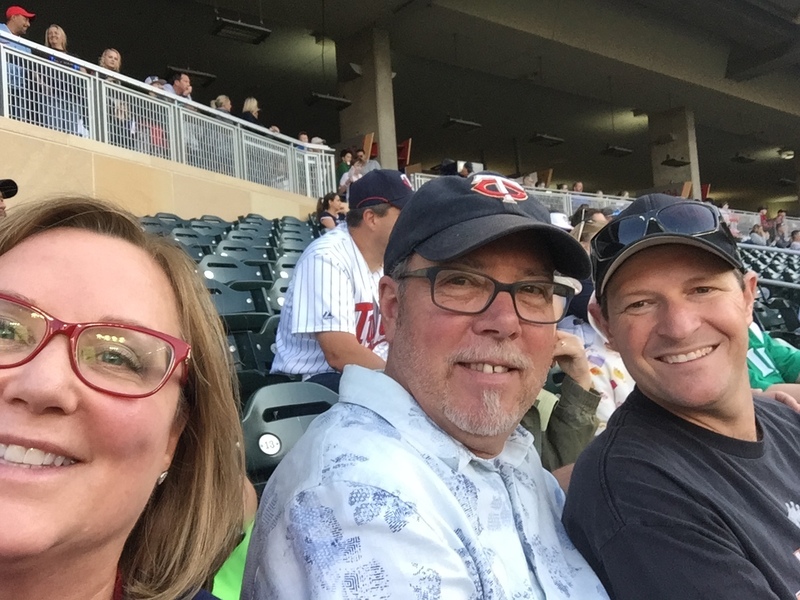 Then we sat in our assigned seats for a while before doing what’s one of the best things you can do at Target Field. We walked all around it and checked out the view from different perspectives. He was right. The Kansas City pitcher had a perfect game going. It was about to be the bottom of the seventh, so we decided to wait to see if we’d witness history. The Royals pitcher was Jorge Lopez, and I’ll admit I was not exactly totally familiar with him. As in, I hadn’t heard of him. He got three straight outs in the seventh. We stayed. He got three straight outs in the eighth. We continued to stay, and it was great to feel the buzz in the ballpark. Despite the fact it was a Kansas City pitcher doing it, the Twins fans were getting behind him. The Royals led 4-0 going into the bottom of the ninth, so it wasn’t really about a Twins rally. Twins fans wanted to see the guy succeed. Sure enough, Robbie Grossman was the next batter and he lined a base hit to left. The Twins fans gave the pitcher a standing ovation. Now all we had to wait for was a loss, so Barbara and I headed for the car. Mike headed for the light rail station. The next day, Mike’s real job took over as producer of the 49ers radio broadcast for KNBR, and that gave Neighbor Dave and Terry Blake their chance to spend the game on the sidelines, holding the parabolic microphones to pick up the game action audio. 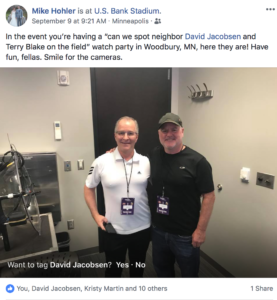 Barbara and I headed over to the Jacobsen’s house to join the two wives (Nichol Jacobsen and Lynn Blake) along with Nichol’s longtime friend Allison, with our goal to be threefold: We would eat well, imbibe a little, and simultaneously play the “Spot Dave or Terry” game. We think we saw them a few times, but it was frustrating that the camera operators really kept it tight and never showed the microphone guys (other than the FOX network guys, because they get the best spots and wear bright vests) especially when we wanted to see them. So many shots of the game where you could see feet on the sidelines, but nothing above that. The guys did have a blast and no one was flattened by a runaway linebacker, so that’s all good. I made the decision months ago, right after the schedule came out, that I wanted Terry to get to experience this with Dave, who was in his third game on the sidelines. Once was enough for me. It’s thrilling, nerve wracking, and tiring, but it’s one of those things most people never have a chance to do. And they survived! Finally, in this short blog segment, I’ll post something I put on Facebook earlier in the week. I found a 1979 Lakeland Tigers game program on eBay and it arrived in the mail a few days ago. Sadly, no team photo and no individual headshots, so that was disappointing, but the original roster was still inserted inside the program. That’s remarkable, because it was just a photo-copied sheet folded in half and stuck in the center spread of the magazine. Yeah, I’m on there. The rest of the program is mostly a combination of ads and “lucky numbers” for in-stadium giveaways. Ads that are that old are always worth looking at in a nostalgic way. Speaking of nostalgic, the program itself sold at the game for 50 cents! Anyone who has read “Bats, Balls, & Burnouts” might recognize more than a few of these names. On the Tigers, you’ll see my roomie and teammate from the Paintsville Hilanders, Dan O’Connor, otherwise known as OC in the book. You’ll also see John Crawford, the catcher who wanted the Tigers to release him, but they wouldn’t. My best buddy on that team, Howard Bailey, is listed. There’s Mike Wright, the former Vanderbilt quarterback who got thrown out of an early-season game, which gave me my first chance to play in the Florida State League, over in St. Pete. And there’s Howard Johnson, who went on to Major League fame with the Tigers and Mets. Larry Pashnick and Bruce Fields also made it to the big leagues from Lakeland. And, of course, our manager Fred Hatfield. At the bottom of the roster, there’s a note about a couple of upcoming games, and the second of the two notes is about another great story from the book; the night the tightrope walker went back and forth on a wire stretched between two of the massive Joker Marchant Stadium light towers. We were all forced into holding ropes that steadied the wire. It was terrifying. As for the St. Pete Cardinals roster, it is absolutely littered with future big leaguers. George Bjorkman, Luis DeLeon, Al Olmsted, Andy Rincon, John Stuper, and Kelly Paris all played in “the show” for sure. There may be others, but I don’t have time to do all the research right now. 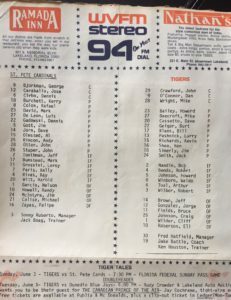 But all of them added together didn’t equal the excitement of seeing Jim Gott’s name on that roster. He was a huge part of the book, after I spotted him in the Mexican Winter League and the Blue Jays then took him as the first pick in the Rule 5 draft, plucking him out of the Cardinals’ organization. Later, when I was working for Converse Shoes in Southern California, I had Jim under contract to wear our spikes for the Dodgers. Dodger Stadium was where I finally got to meet him, in 1990. It was his ninth year in the big leagues, out of what would eventually be a fantastic 14-year Major League career as a reliever. 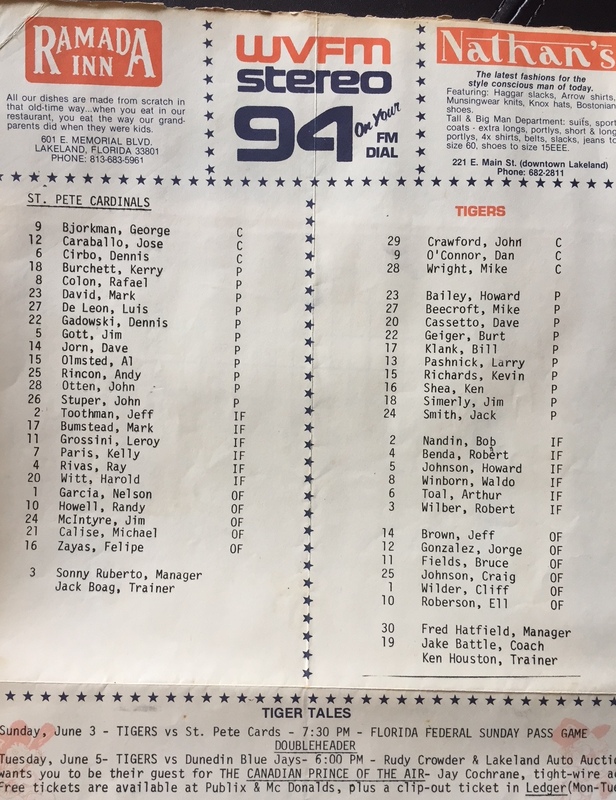 Until this roster and program came in the mail, I had no idea that Jim Gott and I played against each other. What a crazy small world. So that’s it for today. Time for me to go to the bank, get a haircut, do some laundry, and think about what Barbara and I are going to have for dinner. Too bad we can’t sit around the fire pit. I’ll see you next week, and until then remember this: If you just read this and you liked what you saw, please click on the “Like” button at the top. 12,000 more Likes and I get one of those multi-colored beanies with a propeller on top!